It is an undisputed fact that the best way to master all the concepts, nuances and everything else that a subject has to offer is by doing projects based on it. By doing a project you get the much needed practical and hands-on experience that is sadly missing in theoretical learning. But how much is such a practical experience going to help you in your career? Is practical experience gained through projects really useful? How is the hands-on experience better than a wider theoretical knowledge? These are some of the questions boggling the minds of undergraduate and postgraduate students trying to start a bright career in this job famished times. Companies, especially the ones offering internships, look for students who have a good knowledge of the subject along with some practical experience, a combination best achieved by doing relevant projects. Projects are generally done in groups. They foster teamwork, communication skills, planning skills and leadership skills which companies usually look for. You also become bold and react to stressful times with suitable and positive responses. Projects are the ideal platforms to showcase your skills and areas of interest. If you have come up with a unique idea or have chosen a decorated topic where you learn new skills and employ concepts effectively, it is easily your ticket to a good job. While working on projects or racking your brain for an idea, the chances that you “Identify what you are really interested in” is quite high. At IT Edge, we help you start exploring different areas and find out what you are interested in actually learning. Our experts present you with lots of details on every possible area, you actually learn more about your subject before choosing one. The choice will obviously be the right one. 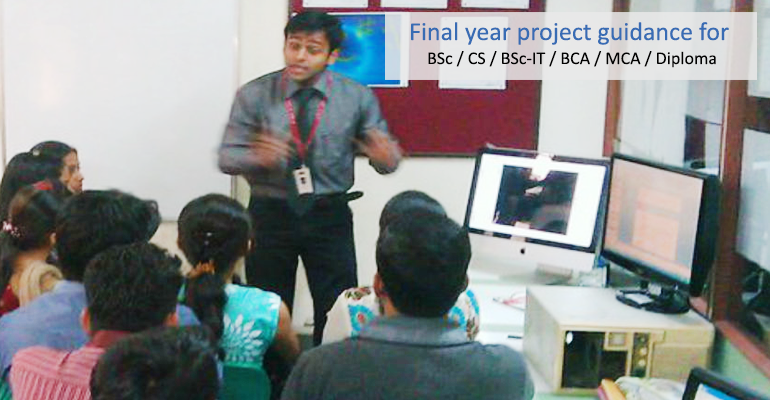 We offer our services to students looking for Final Year Project training in Mumbai. In order to get the most out of a project experience, i.e. get the best learning and practical knowledge possible from doing a good project, it is important to get the best guidance. Get the best support and resources required to efficiently complete your project. Else, you may have to spend time searching for requirements and rectifying common mistakes which may have otherwise eluded your team members. Avoid making critical errors which may spoil the entire project. An experienced mentor can advise you on possible areas where errors are common yet critical to the project. Follow the Industry best practices, use the latest technology and conform to quality standards just because they insisted. In addition to being the best place to do your Final year project in Mumbai, we offer exquisite guidance to all our students in every step of the way. Get Project guidance from expert trainers who are vastly experienced in giving the individual attention and important inputs needed for the successful progression and completion of every project. They understand your every need, that is why we are very popular among students for our Final Year Project Guidance in Mumbai. Our developers can help you build a great project with their comprehensive experience in working on various technologies while guiding the student on their BSc IT Final Year Project and BSc CS Final Year Project in Mumbai. We start training on every project with the basics. We help you split up your project into simpler modules for easy understanding. We have a well-developed repository of foundation content. We help you individually develop each module by offering our assistance in every step in case you are stuck. We don’t believe in Readymade kits or Pre-written programs. Finally, we guide you in integrating every module into a fully functional end product. Finding a suitable project and experienced guides to help you out can become difficult especially if you are pursuing a post-graduate degree simply because of the complexity and specialty of the subjects. Worry not! Our professional trainers are experienced in handling the most complex of designs, languages and codes with their years of experience in guiding BCA Final Year Projects and MCA Final Year Projects in Mumbai. So why look elsewhere? Get the best final year project guidance with IT Edge and reap the benefits of a successful project.